Original Drivers License from country of issue. Rental Cost: Payable by Credit Card - VISA, or MASTERCARD accepted or Cash with a Deposit. Drivers must be over 25 years of age and have been the holder of a driver's license for no less than three(3) years. Persons over 60 years of age would require special authorization from the insurance company. Under such circumstances, this process would be facilitated by our company. A local permit is absolutely necessary for all drivers, this would be arranged by our representatives. An optional Loss Damage Waiver (L.D.W.) is available and recommended at US$12.00 per day. If accepted Your excess would be US$550.00. Note: Loss Damage Waiver is not insurance it is simply a waiver. If L.D.W. is declined, the hirer accepts full responsibility for all loss, damage, or loss of the vehicle caused by accident, fire or theft, regardless of who is at fault. 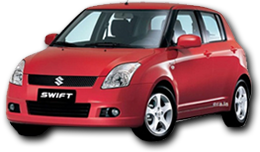 Additionally, the Hirer is responsible for a loss damage waiver deposit of US$1,900.00. Extra Driver charged is a one time US$10.00 and Baby Seats charged at $3.00 per day are additional charges which may be requested at the time of reservation. All rentals are subject to a service charge. The following payment methods are accepted: MasterCard, VISA, Cash with a Deposit. Any rental cancellations must be done 48 hours prior to confirmed rental date or a fee will apply. 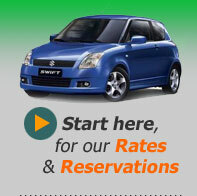 This fee consists of one dayâ€™s rental on the specific category of vehicle booked.